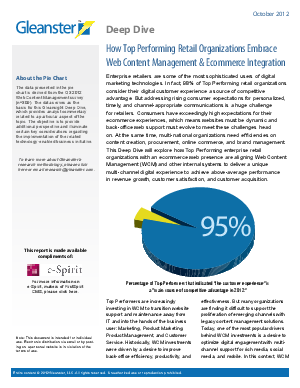 This Deep Dive will explore how Top Performing enterprise retail organizations with an ecommerce web presence are aligning Web Content Management (WCM) and other internal systems to deliver a unique multi-channel digital experience to achieve above-average performance in revenue growth, customer satisfaction, and customer acquisition. Enterprise retailers are some of the most sophisticated users of digital marketing technologies. In fact, 98% of Top Performing retail organizations consider their digital customer experience a source of competitive advantage. But addressing rising consumer expectations for personalized, timely, and channel-appropriate communications is a huge challenge for retailers. Consumers have exceedingly high expectations for their ecommerce experiences, which means websites must be dynamic and back-office web support must evolve to meet these challenges head on. At the same time, multi-national organizations need efficiencies on content creation, procurement, online commerce, and brand management.